in Denmark, Sweden, Norway and Finland. Parcelshops and pickup points are the most popular shipping option in Scandinavia - and now you can easily offer it to your customers. You decide the price, the number of parcelshops/pickup points to show and the actual text. 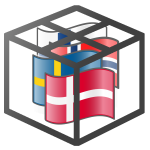 Nordic Shipping Options (NSO) list the ones nearest to the entered delivery address and let the user choose the one they prefer during checkout. Setup is extremely simple and only takes a couple of minutes. Everything is handled directly in Shopify with no requirement for separate accounts in other systems. You can even try it out free for 7 days.